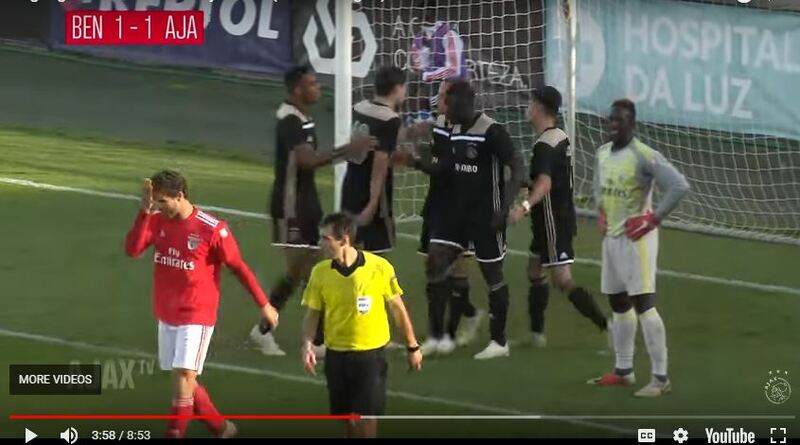 Dutch-born Ghanaian forward Brian Brobbey was on target for Ajax U19 as they drew 3-3 with Benfica U19 in the UEFA Youth League on Wednesday. Brobbey, 16, restored parity for the Dutch side with a superb strike on the stroke of half time. The Portuguese outfit regained their lead via Nuno Santos who converted a 13th minute a spot kick. But, the Ghanaian led the charge for the visiting club with a impressive athleticism and predatory instincts. He constantly charged forward and tormented the hosts defence. Noa Lang laid a pass through inside the box and the Ghanaian raced into the box to side-foot the ball past the hosts keeper. Brobbey was born to Ghanaian parents in the Netherlands and has represented the European giants at U17 level. He is related to Hertha Berlin defender Derrick Luckassen and Almere City attacker Kevin Luckassen.